It arrives in mid-July but can the tablet/laptop compete in the current tablet market? 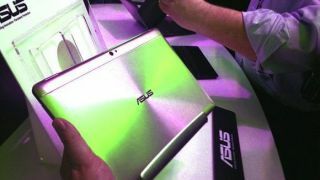 Asus announced that the Asus Transformer Pad Infinity 700 will launch in the U.S. the week of July 16. The Android tablet will start at $499 for 32GB, with the 64GB version going for $599.The detachable keyboard dock will sell separately for $149. The Asus Transformer Pad infinity 700 is a superior version of the Asus Transformer Prime, with a crisper screen (1920 x 1200 compared to the Prime's 1280 x 800) and beefed-up front and rear cameras. The Asus Transformer Pad Infinity 700 is even fully compatible with the older Transformer Prime's TF201 keyboard dock. So, trading in the old for the new won't require purchasing another $150 peripheral. Can the Asus Transformer Pad Infinity 700 compete? But can the Asus Transformer Pad Infinity hold up in today's ever-more-competitive tablet market? "It really depends on where they want to play in the market," J. Gold Associates analyst Jack Gold told TechRadar. He said Asus' "ace in the hole" in the past has been the mid-range, where the Transformer Pad Infinity 700 fits snugly. "Can they stake out a middle ground that is separate from what Google's going to do with Nexus and what Microsoft is going to do with Surface?" Gold asked. "The answer is that they can do that, but they're going to have a lot of competition." "The whole tablet market is due for a radical change over the next one to two quarters, and the change is coming from a number of areas," he added. "One, obviously, is Microsoft," said Gold, referring to the just-announced Surface. "The other is Google's ... if rumors are correct ... new Nexus Tab at a very low price point, which will directly go head-to-head with Asus, Acer, Lenovo, etc. "And then finally, of course, is the iPad, which has a dominant share of the market - they're going to revamp and re-release," he said. He also mentioned the tablet wars will likely boil down to price, as well as features and functions that are tangible to not just "techies," but to mainstream consumers as well.